There are three ways product reviewers respond to all the gadgets and gizmos we receive: dislike and send them back promptly, use them for a while but not long-term, or keep them forever even if it means parting with hardly-earned cash. The new and favorite items discussed below can be proud to be in the latter group. As I write this article, Apotop’s exceptional new AP-U2 barely-external flash drive is inserted into one of my MacBook Pro’s USB ports. I am copying my entire 21.4 Music Folder from my Home Folder onto the remarkably small AP-U2, with its 32GB capacity. AP-U2 comes in brushed aluminum and four attractive colors. Never again will users need to complain about lugging around large, high-capacity external storage klunkers. AP-U2 sets a new standard. Don’t lose it! 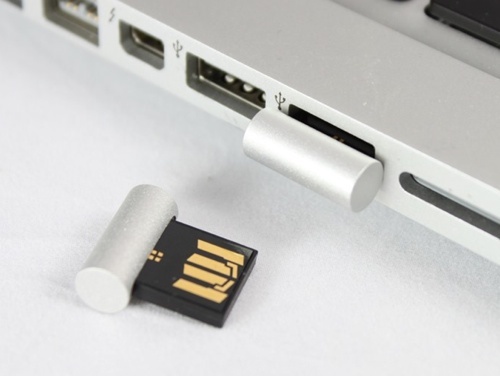 Keep one or two permanently inserted into your MacBook Pro or Air, and you extend your internal drive’s capacity by multi-GBs. Keep one in your car, another one in your tote or purse, and a third one at work or school. Use different colors for different purposes. The possibilities are limitless. And it’s waterproof. CableJive’s new and improved dockBoss air is just slightly larger than its predecessor, but it works and sounds notably better. This small, black, Apple Dock Connector plug insert transmits clear and complete audio via a built-in Bluetooth radio. 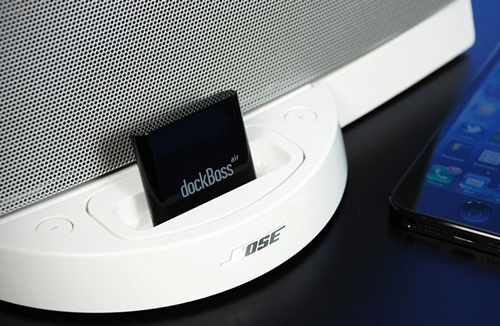 Place dockBoss air into your legacy speaker’s Dock port, pair it instantly via Bluetooth with your iDevice, hear an audible confirmation, and listen wirelessly within an extensive range. That’s it. This version of dockBoss air includes the addition of remote control functionality, to play/pause, skip tracks, or adjust volume levels if your system comes with a remote. CableJive removed the pairing code needed to connect to the dockBoss air. Now you simply find it in your list of Bluetooth devices and click once to connect. MyMac approves of the new audio-cues to notify users when the device powers on, connects, or disconnects from a device. 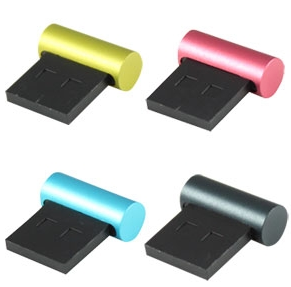 Do you have a new iPhone, iPad, or iPod touch with a Lightning port that isn’t compatible with your Dock connector speakers? I certainly do; at least five of these legacy speakers. Don’t despair — get a dockBoss air. Extend the life of your audio equipment and enjoy fine wireless audio transmission. Battery-operated rechargeable wireless Bluetooth portable speakers are getting better, smaller, and less expensive every month. 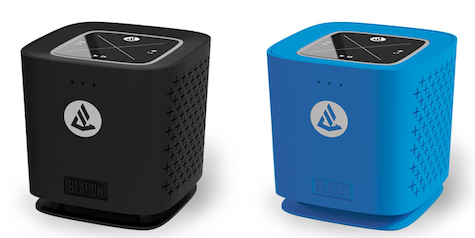 Beacon Audio’s second edition of The Phoenix 2 Portable Bluetooth Speaker isn’t the loudest, smallest, or cheapest, but it is a keeper, with an affordable $80 price tag. Phoenix 2 is a new version of the Phoenix. MyMac got one of the first looks and listens. The exterior is a little different than the original Phoenix and there is a new on and off switch. Phoenix 2’s music playback sound is good to very good, distortion is almost nonexistent at maximum volume, and the top deck controls are easy to view and use. This speaker’s shape, size, color, and battery life are winners. A clever designer developed the unusual exterior rubber surface and unit’s light weight with bottom-firing junior sized subwoofer. This small Bluetooth speaker isn’t audiophile quality, but everywhere I demo it, people are impressed and willing to buy it from me for full price. No dice. I’m not letting the adorable blue The Phoenix 2 out of my sight, except when it’s playing clearly up to forty feet away on the patio during an enjoyable and music-filled meal outdoors. Or when I’m clearing a million fallen dried olives out of our gutters. Bluetooth-enabled speakerphone features are becoming standard on portable speakers. Phoenix 2’s telephone sound quality is not as clear as its music playback, but speakerphone capability is useful in a pinch.